First, there’s CC Attribution (“CC-BY”). This essentially means everyone is free to do whatever they want to with your work, so long as they give acknowledge you as the original creator of the work. So someone could use your photo in a commercial book and make money from it, or edit your photo and share it, and the subsequent works do not have to be shared with a CC licence. (Although of course they still have to say “this is where I originally got this from”). If you look right at the bottom of this page, you’ll see that this blog is licensed CC-BY, so all of my writing can be used for pretty much anything! Secondly, there’s CC Attribution Share-Alike (“CC-BY-SA”). This gives people the rights to do whatever they want with your work, as long as they attribute you as the creator, and share subsequent works with the same licence. So if someone makes something cool with your work, they’re going to have to share it with people in turn so others can use their work in the same way as they used yours. Thirdly, there’s CC Attribution NonCommerical (“CC-NC”). This is the same as CC-BY except obviously people can’t make money from your work, or use it in commercial ventures, and of course they must attribute you as the creator. Fourthly, there’s CC Attribution – No Derivatives (“CC-ND”) which means that people can share and use your work commercially, but can’t make any changes to it. And of course they have to attribute you as the creator of the work. If you’re still confused, Creative Commons HQ has put together a handy tool for figuring out which creative commons licence is right for you. And there’s this nice poster/diagram put together by the NZ branch of Creative Commons. While any creative commons licence is better than nothing (ie “all rights reserved”), it’s important to note that some are better than others. Unless you have compelling reason not to, using the most permissive licences CC-BY or CC-BY-SA is a good idea.CC-BY or CC-BY-SA are also required if you want your photos to be used on Wikipedia. That’s because Wikimedia Commons (the central storing place for Wikipedia’s images) is a repository of freely-licensed material, so it only accepts media which is licensed either CC-BY or CC-BY-SA. Politicians spend a whole heap of time engaged in self-promotion — after all, they need to be elected to their job. Hence a big part of a politician’s job is attending events, meeting with members of the public and industry groups, pressure groups etc. At the intersection of this relentless campaigning and the rise of social media is that if you look at politicians’ Twitter or Facebook profiles, they’re always posting pictures of that campaigning online. They want the most people possible to see that they’re working hard, talking to “hard-working New Zealanders”, “Mum and Dad investors”, and “people who just want to get ahead”. They want the maximum number of people looking at evidence of all the good work they’re doing. So politicians post an inordinate number of photos and videos on social media, or perhaps Flickr. They also put out nice photos of themselves for use in the media free of charge. But the problem is that the copyright status of all these images is unclear, and most non-media people would be wary of using those photos for most purposes. With a few extra clicks, all the content politicians are putting up to promote themselves and their causes could be made much more useful, both to the politician themselves, as well as to society. The easiest way to do that is to simply release all your photos and videos under a permissive creative commons licence (CC-BY or CC-BY-SA). That way, the potential of the content is unlocked. For example, someone editing a politician’s Wikipedia page doesn’t have to go out and take a (probably) crappy photo of them, rather they can use a high-quality, flattering photo of the politician and make them look good. Likewise a person putting together a booklet about different politicians’ policies can use a nice photo with a clear conscience. Or someone preserving political campaigns and associated material for posterity can archive content without running into legal barriers. Put simply, put your content on the internet with a CC licence and people will use it to do cool stuff. In light of all the positives, and the lack of downsides, it seems somewhat puzzling to me why more politicians haven’t embraced creative commons. I think the main reason probably comes down to a lack of awareness about creative commons licences and their potential benefits. I thought I’d do a little digging to see what licence the various parties and politicians are using on their Flickr accounts. Flickr has creative commons licences built right in, so it’s a good way of putting photos on the internet. Labour Party: don’t seem to use their account, and all the photos are all rights reserved. Charles Chauvel: one of the only (ex) politicians I’ve seen using a permissive CC-BY licence for his photos. Even though he’s left politics in NZ, his photos are still used for stuff (e.g. 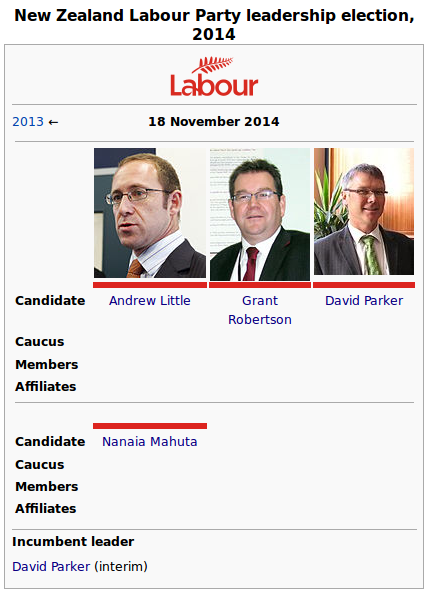 pictures of Grant Robertson and David Parker on Wikipedia above). Bryce Edwards: honourable mention – he put up a whole lot of photos of politicans from Otago University Vote Chat which have been really useful, and which have been transferred to the Commons. If you’re interested in using creative commons licences with your photos on Flickr, Wikipedian Schwede66 has put together a guide for adding a creative commons licences to photos.